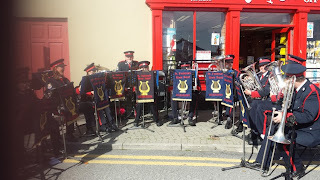 The band has ensured a festive atmosphere from beginning to end of this year's food festival in Skibbereen, opening it in style at the Church Restaurant on the 3rd of September, and also playing at it's climax last Sunday. Join the band for more great music this coming Friday 20th of September: it's Culture Night! Playing in the sunshine at Skibbereen Food Festival.